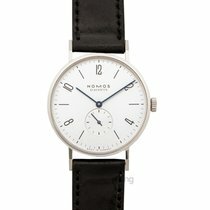 This Nomos Tangente 164 Leather Bracelet (wrist size: inches) Stainless Steel Bezel (case size: 37.50) White Dial unisex watch is in Excellent condition. The watch has a(n) Manual movement. The crystal is Sapphire. 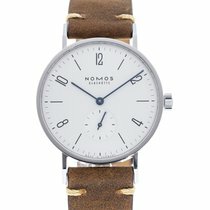 Additional Notes: This timepiece is in overall excellent pre-owned condition with some light wear to the leather strap. 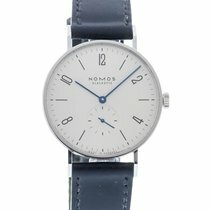 All photos are of the actual watch being sold. 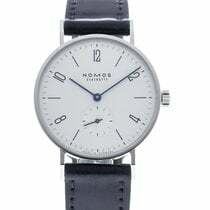 Powered by Nomos' in-house Caliber α (Alpha) which contains 17 jewels and has an approximate power reserve of 43 hours. 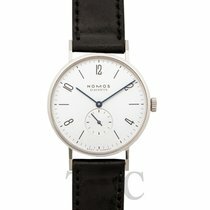 Comes with original Nomos box, blank papers, and manuals. Most importantly, this watch is located at our facility, is Crown & Caliber Certified Authentic, has undergone any necessary service, and comes backed by our 1-year warranty. Prior to shipment, the watch will undergo a final quality control check to ensure it is functioning as intended.